Most distance runners, along with their coaches, have a good idea what to expect each time they toe the starting line. Their mileage and workouts and general fitness level can tell them how fast they are ready ro run. But sometimes a runner finds motivation and inspiration and combines that with a heart that can't be measured, which can add up to something they didn't see coming, something magical. 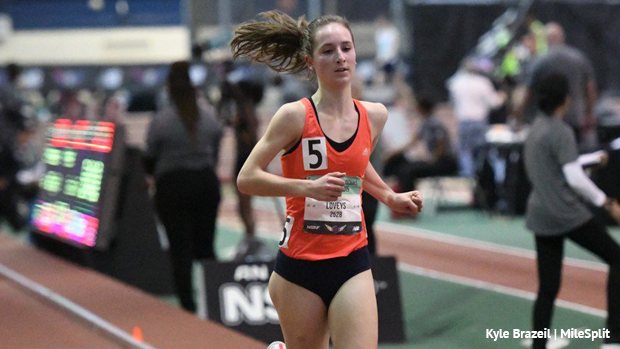 That's what happened to Abby Loveys this past weekend at the New Balance Nationals at the New Balance Track and Field Center in New York when the senior at Randolph pulled off a stunning distance double, one that will go down in NJ history as a performance for the ages. Loveys, who won the 1,600 at the Meet of Champions last spring and the cross country Meet of Champions this past fall, missed a week of training in mid-February after getting the flu, which caused her to miss both the NJSIAA Group 3 Championships and the NJSIAA Meet of Champions. Although she got in a couple weeks of training before nationals, Loveys was a bit unsure what she was capable of running. "Without that build up of races to nationals and missing a week of training, there was a little doubt in the back of my mind about how I was going to run,'' said Loveys, who placed 11th at the Foot Locker XC Nationals in December. But when she got the baton to run the anchor leg of the distance medley relay on Friday night, Loveys erased all those doubts. Fueled by her teammates and her own personal motivation, Loveys, who was in 11th place when she got the stick, didn't stay there for long as she blasted a 4:48.02 anchor leg-the fourth fastest split of the race, to bring Randolph across the line sixth place in 11:53.55, No. 9 in state history. The sixth-place finish secured the final All-American spot for Randolph. Loveys anchoring the DMR with a 4:48.02 split. Feeling sore the next day after her first race in exactly a month, Loveys wasn't sure how much her valiant anchor carry would take out of her legs in Sunday's loaded two-mile final. But once again, the Princeton-bound Loveys rose to the occasion with not just the greatest track race of her career, but one of the greatest races in state history. 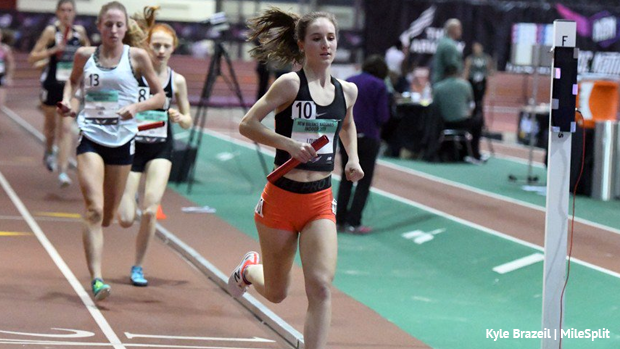 With Katelyn Tuohy of North Rockland, NY chasing the national record way out front (Tuohy wound up winning in a US#2 All-Time 9:51.05), Loveys found herself running in uncharted territory at a pace her legs had never felt before. But Loveys never backed down and stayed right in the thick of the chase pack as she went through the mile mark in a crazy fast 5:03 and change. The pace slowed as expected after such a fast start, but Loveys continued to race like a warrior, refusing to flinch as pushed herself to a place she'd never been before. When she crossed the line in sixth place to lock up her second All-American finish, Loveys froze the numbers on the clock at 10:21.00, the third fastest time in state history!!! The 10:21.00 crushed Loveys' previous personal best of 10:34.25, which she ran to win the 3,200 at the North Jersey, Sec. 1 Group 3 meet on Feb. 8, her last race before nationals. So Loveys ran a 4:48.02 1,600 split and a 10:21.00 two-mile less than 48 hours apart, and just a couple weeks after she battled the flu and missed significant training time. How awesome is that? What a remarkable feat!!! Guts, fortitude, resiliency, determination, and an iron will!!! Loveys displayed it all!!! Loveys and Julia Trethaway showdown in the 3200m at Morris County Champs. Loveys said missing the state meet and the Meet of Champions hit her hard. Although she couldn't run, Loveys found inspiration at the Meet of Champions. "I went to the Meet of Champions and when I saw my teammate (Meredith Finley) finish fourth in the 1,600, that really inspired me,'' said Loveys. Randolph distance coach Kevin Higgins, who says nothing Loveys does surprises him, marveled at what his star runner accomplished. Higgins said for Loveys to come back and run 10:21.00 in the two-mile was nothing short of amazing. "She was very sore the next day, which is not surprising,'' said Higgins. "So once again there were doubts going into the tow mile against the best in the country. After a very fast opening mile (5:03 and change), Abby was in no man's land for a bunch of laps sitting in sixth. A couple of girls were creeping up on as she approached the last lap, but once again she put together a monster last lap of 34.5, nearly catching the 4th and 5th place runners. It will be hard to find a distance double for a NJ girl that matches up with that, especially considering the circumstances. Amazing stuff." Loveys is now in some very fast company. Only Ashley Higginson of Colts Neck, who won the NBNI title in 2007 in 10:16.75, and Brittany Sedberry of Ocean City (10:19.30 in 2006) have run faster for two-miles in NJ indoor history than Loveys. It's just a matter of time before NJ runners will feel the same way about putting their names up on the All-Time list alongside Loveys, who has established herself as a true NJ legend! !